Dying Light was one of my favorite games of 2015. As far as first-person zombie survival games go, the last game I played like this was Dead Island and boy did Techland outdo themselves. 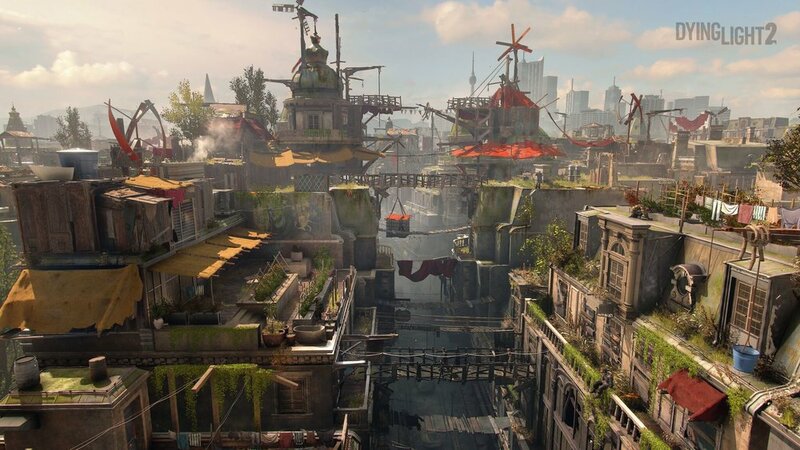 What I loved about Dying Light was how well it married melee combat with an easy to master parkour system of traversal, which turned the decaying and distinctly European city into a playground. Zombies groaned and shuffled along, waiting for you to bash their heads in with a variety of melee weapons, survivors were caught in tight spots and prayed for player intervention, and cargo drops made for a nice risk/reward system against the more malevolent humans that have taken refuge in the area. At night, the city turned into a full survival horror game as you sneaked around trying to complete quests and collected supplies while deadlier zombie abominations patrolled the streets looking for fresh meat. Seriously, Dying Light is such a well-built game and if you haven’t played it already, do so now! The announcement of Dying Light 2 at Microsoft’s Xbox E3 briefing was one of very few legit surprise announcements for me. After seeing the title card pop-up at the end of the trailer, I was set. I didn’t need to see anything else other than a release date. But then I smiled, having remembered that I had an appointment to meet with Techland staff over an “unannounced” game. I kept looking at my watch for the rest of the Xbox conference. “Was it time for my meeting yet?” No. “How about now?” No, just wait a day. “OK, but is it time now?” I never knew how obnoxious I could be! Now, Dying Light was a great game that didn’t need a whole lot of improvement. I mean, sure, there’s always room for tweaks and modifications but on the whole, I thought it did a fantastic job of making the player feel like they’re constantly racing against time, be it trying to secure supply crates or hopping across rooftops to beat sundown. In Dying Light 2, the circumstances have changed. Set some years after the first game, humans are as plentiful as the zombies that roam the city streets and while the undead creatures are a constant threat, the real war is between two human factions: the authoritarian Peacekeepers and a rabble of bandits that follow the theory of survival of the fittest. One of the big themes of the sequel is a concept called the “modern dark ages.” What this means is that humanity has regressed into a state where technology barely exists and society has returned to a more “simple” lifestyle out of necessity. The developers on hand were eager to point out that as an extension of the “dark ages” theme, there will be no firearms in the game and instead it will emphasize melee weapons and parkour movement. In Dying Light, apart from saving people from zombies and human psychopaths, there was no way to tell what you were doing had any sort of noticeable impact on the populace. For the sequel, that’s going to change with the idea of a “narrative sandbox.”. Many of the missions you’ll undertake will have you interacting with the Peacekeepers and the thugs, and performing tasks for these groups will have a dramatic impact on the city. For example, the mission I saw during my demonstration featured a plan to secure a water tower. If you kill the thugs guarding the water and claim it for the Peacekeepers, you’ll find that over the span of a few in-game days, the area will be more vibrant, lively, secure, mostly free from zombies, and water flows freely. If you work out a deal with the thugs and let them have the water tower, coming back to the area after time passes will be a much different place. More zombies fill the streets, parkouring your way around will be harder, the area is in a serious state of disrepair, public morale will be an all-time low, and worst of all, you’ll have to pay for the water. Making things not so black and white, the Peacekeepers are a somewhat morally ambiguous force. They may do good things and keep order but at the expense foster a rigid, authoritarian style of leadership that deals in severe punishments against those who try to steal and hurt people. And all this happens during the day. While you will face zombies, they will do their best to stay out of direct sunlight. There was one part in the demo that was absolutely terrifying: in order to reach the objective, the character had to work his way through an old building filled with sleeping undead. Flashing a light on them or making too much noise will wake the horde but careful movement will see you get away unharmed. If you do alert an undead mob, heading out in the sunlight will go a long way in keeping you safe. Zombies will also stay away from areas bathed in UV lighting which can be used to your advantage, be it to aid in an escape or set them upon unwitting humans. When the sun goes down, you’ll need to seek out shelter because the zombies become more of a threat and just like the first game, there are worse things out there than brain hungry ghouls. I cannot wait to play Dying Light 2! Based on the presentation, it hits all the right notes for a sequel. It expands on the gameplay mechanics of the first game while deepening the fiction and world building by introducing more humans that fall inside that dark, gray space of morality. Worry not, though, because you won’t have to face the terror alone as Dying Light 2 supports up to four players in online co-op and like partying, drinking, and zombie slaying, everything is better with friends. Another exciting bit of news connected to the game was the partnership with Chris Avellone from Obsidian. Also worth noting is that members of the writing team from The Witcher 3 are on board to tell stories (it was mentioned that the people responsible for the awesome "Bloody Baron" quest in The Witcher 3 are doing the writing). I didn’t get to see much of what it’s like exploring the world at night but if it’s anything like Dying Light, it’s going to be terrifyingly exciting. And given all the talent on hand, this game can’t come out fast enough.